One generation after another has adapted to local needs, market trends and economic vicissitudes—from the boot soles crafted by French-Canadian patriarch Napoleon Bail to the custom-made shoes and orthotic devices made five generations later by Chris Bail, CPed, and his daughter, Laura Bail, CPed. The Canadian immigrant’s son, Chris Bail’s grandfather, took the company’s shoe repair business, which by that time included selling shoes as well, to its next iteration when he graduated in 1924 from the American School of Practipedics in Chicago, where he studied under footwear icon William M. Scholl, MD. That clinical emphasis has been with the Bails ever since. Chris Bail’s father, Oscar, brought to the company not only the technical expertise he’d absorbed from his own father but also the business skills he’d learned in college. At the time, that dual skill set seemed ample for continuing to build a shoe retail business. But, in 1964, Oscar Bail attended a sales convention and was invited to undergo certification as a pedorthist. The shop became a key player in the newly emerging pedorthics movement. Chris Bail became an employee of his father’s shop, then called Bail’s Shoe Store and later Oscar Bail & Son Shoe Store, when he graduated from high school. “I started with gaining an understanding of how a shoe was made. Then my father began teaching me to fit shoes,” he said. Around 2000, just as Oscar Bail made the decision to retire, the economy in the Pioneer Valley became precarious, and businesses of all kinds had to adapt quickly or risk failing. Chris Bail saw that the retail side of his business might be a necessary casualty. “We were doing so much more in the pedorthic business than the retail business that I wasn’t really interested in selling shoes conventionally anymore,” he recalled. What interested him most at that time was crafting foot orthoses. But he lacked the necessary certification. Contemplating the pros and cons of more training, Chris found motivation from an unexpected source: His daughter Laura, barely in her twenties at the time, said she would attend pedorthic certification training with him. 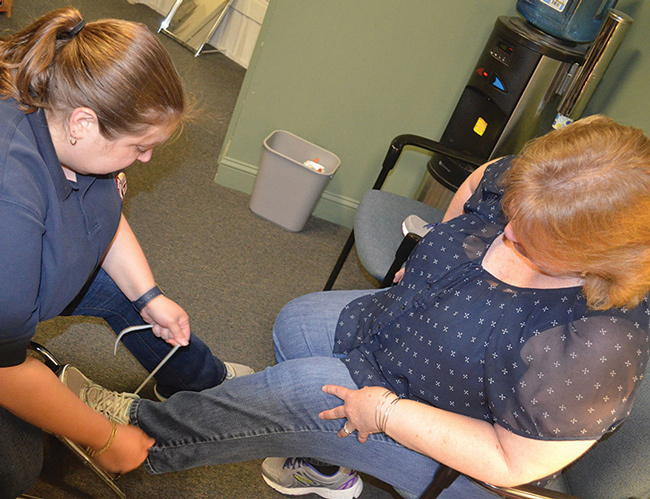 Father and daughter, upon completing 120 hours of coursework, rebranded their new business as Bail’s Custom Footcare and worked out of a podiatry practice for two years before establishing their own office, this time in South Hadley, MA. “Today we work in close relationships with general physicians, orthopedists, podiatrists, knee specialists, and pediatricians,” Chris Bail said. 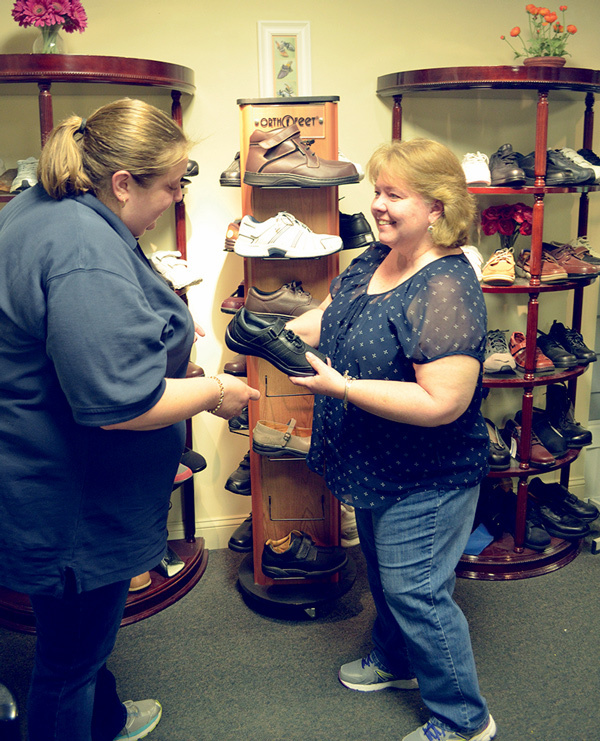 They both split their time between appointment days, when they may see as many as 25 scheduled customers, and lab days, when they do the hands-on crafting of shoe modifications, orthotic devices, and other foot health accessories. Nancy Shohet West is a freelance writer in the Boston area..